It’s a headache – taking your original content and adapting it to suit the various social media channels on which it will appear. Less savvy marketers question why they should bother in the first place; they go on to make the fatal error of simply dumping the same content on every social media network like an unwanted baby. This leads to the message looking “spammy”; not a great look for any brand serious about managing their social media networks. But smart managers who want to promote consistent, branded messaging know that it’s imperative to adapt the content for each platform so the message remains fresh and relevant. Most importantly, the savvy marketer regards all the social media networks they use as allies, not as competing rivals, using each to support and nurture their brand’s core messaging. But what are the key strengths and weaknesses of the top four social media channels? Twitter’s 140-character restriction shouldn’t be seen as a roadblock to creativity but something to be exploited, forcing you to hone your missive so it hits its mark quickly. Remember, we humans now have an attention span of eight seconds, so any message needs to be delivered efficiently. 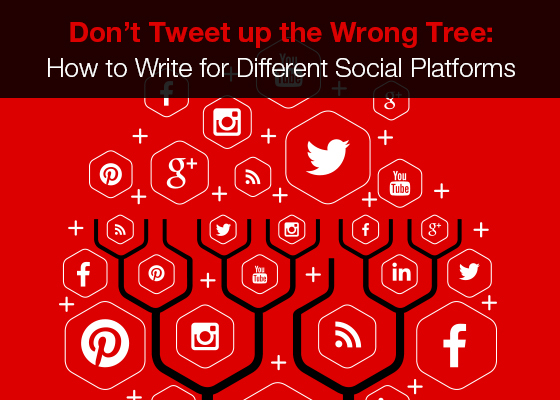 Ensure your tweets are catchy, feature questions, and are fact- and figure-driven. The idea? They act as strong CTAs to encourage click-throughs. Format wars: just say NO to CAPS! Don’t dump grammar, use abbreviations or deploy CAPS to try and STAND OUT (or cram in as much information as possible) – it looks desperate and unprofessional. An abbreviation that works just fine, though, is shortened URLS (use Bitly that also allows you to track click-through rates) if you want to save on space when promoting a link. And Twitter itself knows it – it recently overhauled its interface to make it more visually dynamic. ...because 70% of smartphone users access Facebook via their device. And what might look arresting on a large screen could be a confusing jumble of pixels on a mobile – so ensure whatever you’re posting is legible on any screen size or format. The only potential free solution? Ensure that your content is exceptional and encourages shares. While the adage “less is more” is true in the social media space, LinkedIn is aimed at professionals who are open to reading in-depth information about the issues they’re interested in. So take this valuable opportunity to show off your knowledge and insights fully. After all, on LinkedIn, “long-form” isn’t a dirty word. LinkedIn can be very effective for lead generation – because businesses want to hear from companies that can help or educate them. So deploy relevant marketing offers and engage with users via LinkedIn Groups; according to Power Formula, 53% of LinkedIn users join 10 or more groups so they are expecting to hear from like-minded businesses as long as your content and postings aren’t “salesy”. And if setting up your own group, harness the power of LinkedIn Announcements to attract followers. Linkedin doesn’t like automated posts – it thinks they’re “spammy”. The best approach is to maximize the engagement potential of your posts – promote a single post to increase comments, clicks, likes, and more – and, if you hit your mark, LinkedIn could well do the rest, highlighting it under a key trend or featuring it in LinkedIn Today email sends. …the tough start throwing money around. While Google+ has experienced a rocky ride since its inception, it’s now growing as the tech giant continues to invest heavily in the platform. Any marketer treating Google+ simply as Facebook’s “poor cousin” risks missing out on a social media network with huge potential. The social platform is a marketer’s dream – perfect for SEO, it features a host of tools to track users and what they are doing. from personalized searches to social signals. Google+ offers some exceptional core functionality too – monitor its “Hot Topics” to see if there are any issues that you can comment on; use hashtags to increase your page’s reach (G+ already automatically adds a hashtag for topics that are trending); or join communities relevant to your business and get contributing. Google+ users are less verbose than their Facebook counterparts and aren’t ones for “fandom” – so when you do find someone engaging with your business, make sure you strike up a conversation and nurture their interest. While the idea of sending a single post into the online space to attract thousands of people is enticing, the reality is far from ideal. Blanket bombing your marketing message leads to lousy leads. Social platforms offer marketers the opportunity to embrace the power of the niche instead – targeting highly specific groups that can benefit from your products/services. Exploit this approach fully and, in the long term, it will prove to be your most effective marketing strategy for generating leads and increasing genuine customer engagement. While we’ve covered the fundamentals of content writing for different social media networks here, there is another key area that needs thought – the difference in communication styles in certain countries. For instance, in Russia, users prefer to write using formal, full sentences on their social media networks – and your own content needs to reflect these cultural differences. Use all your social media networks as allies, not as competing rivals. Ensure tweets feature visuals and questions, and are fact- and figure-driven. Make Facebook content exceptional, to encourage shares, and suitable for mobile. Don’t be shy of showing off knowledge and expertise on LinkedIn, but don’t be “salesy”. Don’t make the mistake of ignoring Google+. Strike up conversations and nurture interest.